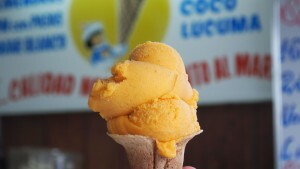 Two scoops of lucuma ice cream in Huanchaco Peru. Lucuma trees are native to the Andean region of Peru and if you have the chance to taste a fresh slice you may not be very impressed – the pulp is dry and starchy which masks its amazing flavor. However, once the pulp is dehydrated and ground into powder it can be added to smoothies and deserts. In this form the fruit is transformed in to a delicious flavoring additive with a caramel or maple syrup-like taste. In Peru it is the most popular ice cream flavor easily beating out vanilla, strawberry, and even chocolate. Lucuma powder is increasingly popular with health food and raw food enthusiasts because of its dense nutrient content and its ability to create a creamy texture. Lucuma powder can be purchased online at Navitas or Live Superfoods.